After a successful first season, King of the Hill continues with more of the same, but it’s the kind of development that really works for this kind of show. There are some episodes that take advantage of the animated medium, including the unlikely events of a huge twister and an unexpected explosion for a season cliffhanger, but generally this show’s strength is that it deals with the everyday clash between traditional conservative America and the modern world. What I like about King of the Hill is that Hank and Peggy are no more angels than they are clowns. They are in many ways stereotypical and absurd, but they’re also good-hearted without being heroic. They do their best even if they have a lot of daft values and are prudish to the point of silliness, and equally they’re often in the right without being role models. Their small-minded conservative values are lampooned, but the left-wing hippies and bureaucrats they encounter are more ridiculous still. There are interesting questions raised here about tolerance and progression, as when Connie wants to join the boys’ wrestling team and Peggy has to begin to question if girls and boys ought to be able to do the same things, when Hank has to accept his mother’s Jewish boyfriend and poor Bobby gets entirely the wrong idea about a black comedian’s race-based jokes. While the more exaggerated episodes are interesting, like when Hank takes a video store to court, the Hills and Khans go to Mexico or Peggy finds out the truth about an old romantic story and hunts down a random woman who once kissed her husband, the best episodes revolve around small-scale family issues. The kids get lost in some local caves, an uppity academic organises a dig in the Hill’s back yard and Peggy’s loyalties are divided, and poor Luanne has to deal with her alcoholic, manipulative mother. My favourite episode was a little on the exaggerated side, though. Hank has a mix-up over where to buy fish bait and gets in a whole lot of trouble. It’s just credulous enough to work while being a very silly, funny situation. The season finale heralds a bit of a shake-up, and I think that’s needed. 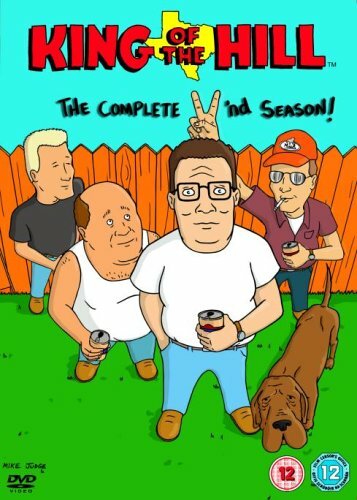 While I really enjoy King of the Hill, already at season 2 it runs the risk of getting stale, so the key now is a bit of variety. We’ll see in season 3!